Visit the Tsubaki Booth at the Global Petroleum Show (Hall F Booth 8133) on June 10-12 for a chance to win cool prizes! Oil & Gas distributors, watch out for the Blue Thunder case for a chance to reward your top 5 Oil & Gas customers with a Suzuki VL800TL3 motorcycle! What’s your reward? Customer loyalty, gratitude and a chance to win a Bulova watch worth $850. Not associated with the Oil & Gas industry? Come visit our booth for a chance to win an iPad. *Read full contest rules and details here. 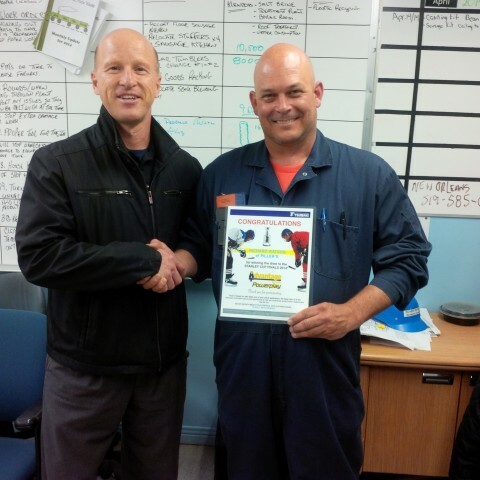 Congratulations to Dean Merkle of Motion Canada and Richard Watson of Piller's for winning the Tsubaki Advantage Power Play grand prize to an all expense paid trip to watch the Stanley Cup Finals. 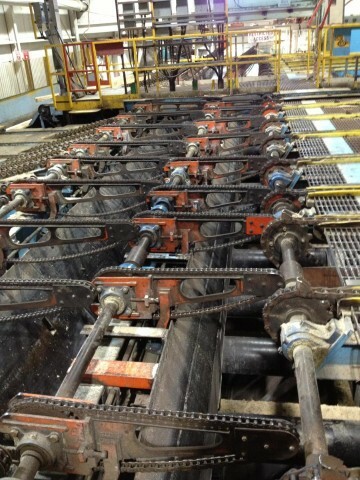 Issue: A competitor’s brand of roller chain was wearing prematurely due to the most common mode of failure, elongation. These drives are high-speed applications that cannot be adequately lubricated due to excessive speeds which results in accelerated elongation. On average, these chains were being replaced approximately every 2 months or 60 days. Solution: We introduced Tsubaki SpeedMaster to the drives as it utilizes a hard chrome plated pin. This hard surface over the pin prolongs the elongation period thus keeping critical drives lasting longer, reducing costly downtime and maintenance. To date, we’ve experienced approximately 14 months or 420 days on these drives resulting in over $7,000 in cost savings! When induction hardening a coil with electric current is used to heat up the sprocket teeth to a specific temperature and then quickly cooled in a water bath. The heating process brings the carbon to the surface and the rapid cooling traps the carbon making the steel harder. The benefits of induction hardening are that the process is very quick and typically very cost effective if we have the correct size coil available. The largest size coil we stock is for a sprocket with a 16" OD although we can purchase larger coils. 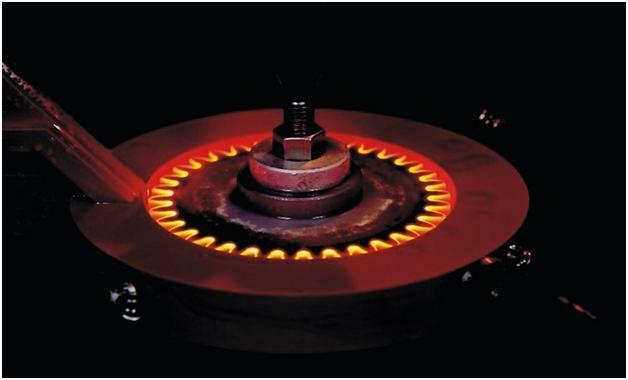 Flame hardening on the other hand is very similar process except a torch is used to heat individual sprocket teeth. Water is still used to cool the sprocket teeth once the specified temperature is reached. The benefit of flame hardening is that the coil is not needed for the process. Thus on larger sprockets we use flame hardening since coils are very expensive for one time use. Also, with flame hardening the ductility remains in the tooth whereas with induction hardening the teeth tend to be more brittle. Most people are aware that hardened teeth on a sprocket will increase the overall wear resistance and sprocket life. But does it matter if the sprocket is induction or flame hardened? Let’s take a closer look at each process to determine when they should be used. Both processes can provide the same hardness range (35-55HRC) for C1045 material. Our standard hardness is 35 HRC minimum and we typically use induction hardening for sprockets under 16" OD and flame hardening for anything larger.